Black is no color for summer. As warm weather comes, my clothing habits change too, and that means pants and jeans are swapped for light skirts and shorts, black for navy blue in case of dark colors, and long sleeve T-shirts for soft and comfy blouses. And of course, as season changes, navy style arrives every year too. Dark blue, white and red colors, ropes everywhere and anchors, straight dresses with sparkles of Chanel's style, big picture hats and so on. I really think this style is always a hit, a timeless and succesful way to solve that ''I have no idea of what to wear'' annoying situation. The key is keeping it simple but putting a few accesories that claim attention. On my case, I mixed a zillion things from different seasons (some of them are ''old acquaintances'' around here, like the Springfield sandals), stole from mum's closet a cute bag (''Mateo'' from Carolina Herrera, such a love! 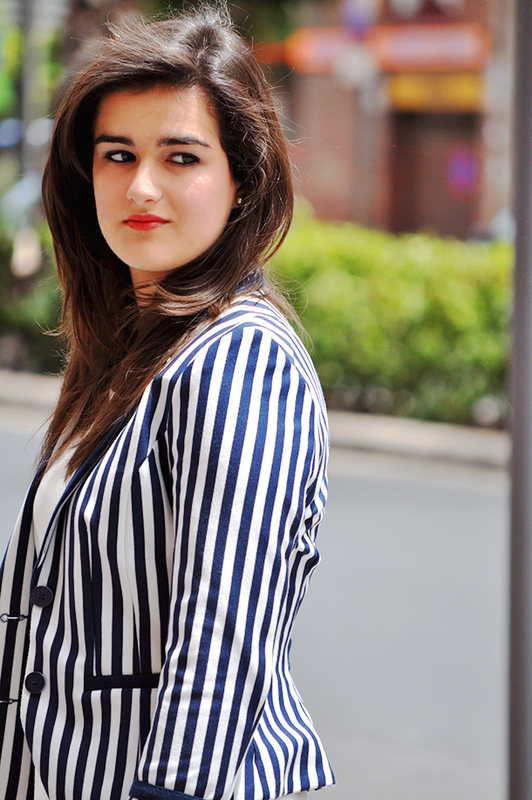 ), put on an stripes blazer, and created a soft makeup. And voilà, this is how the whole outfit looked like! Remember: the giveaway entries are already posted. Check them out and make sure everything is OK! Tomorrow the winner will be announced!